The TSKgel SuperSW mAb products consist of specialized columns designed for the separation and analysis of monoclonal antibodies (mAbs). While mAbs can be analyzed using many different modes of HPLC, size exclusion is best for aggregation, dimer, and fragmentation, making it the best method for heterogeneity studies. The TSKgel SuperSW mAb columns utilize a unique pore-controlled technology, which produces a shallow calibration curve in the molecular weight region of a typical monoclonal antibody. 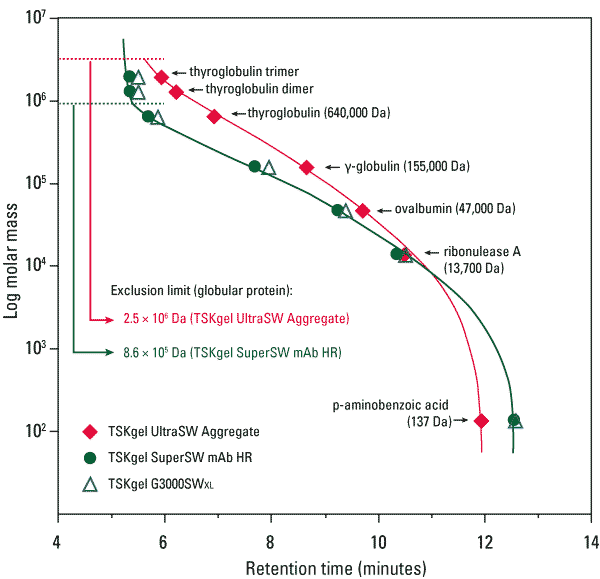 As shown in the figure, the calibration curve for the TSKgel SuperSW mAb HR column is similar to that of the TSKgel G3000SWXL column curve and has a shallower slope than the TSKgel UltraSW Aggregate column around the molecular weight range of gamma-globulin. This shallow calibration curve produces high resolution separations. The TSKgel UltraSW Aggregrate calibration curve shows a separation range up to around 2 million Da, which implies better resolution of aggregate/multimer of a mAb. It is important to employ an UHPLC system or an HPLC system that is optimized with regards to extra-column void volume to take full advantage of the high efficiency that can be obtained on TSKgel SuperSW mAb and UltraSW columns.